I said this would be up on Monday, and now it’s Tuesday, almost Wednesday. What happened, was that I had to do a little housekeeping on my mac as I was running out of space on my startup disk, and to my horror, all my previous backups disappeared because of some spotlight indexing issue. I shall not go into so much technical details right now as my brain is half fried, but I had to re-run Time Machine and recreate a new backup. It took up the most of Monday and while it was doing that, I was afraid to tax the system further asking it the process the movie (which was 1 hour long before editing!) That’s the story in a nutshell. Back to the pattern. This month is all about Girls’ Dresses. So I decided to draft from scratch, a simple dress (I am really not good at fancy names) that can be used to create many different looks. A dress is simply a bodice + skirt combined. 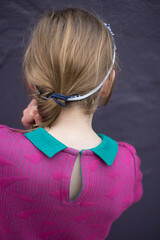 My pattern shows you how to make a round neck bodice with a gathered skirt. Change the gathered skirt to a pleated skirt, or even a circle skirt, and the dress is transformed. Add a ribbon sash, or add in some frills around the shoulders, make it with cotton, double gauze, make it with stripes, prints, solids, co-ordinating quilting fabric, you get a thousand and one looks. The patterns were drafted following the measurements in a well known pattern “textbook” Metric Pattern Cutting for Children’s Wear and Babywear by Winifred Aldrich. Here are the sizes available and their key measurements. And last but not least, here are the sewing videos! It was too long so I had to split it into two videos, and I’ve speeded up some of the boring parts, hope it’s not too fast to follow. Just a word or two about the sewing videos. My methods of attaching a zipper may be a little unorthodox and certainly the “textbook” way, but I find this method a lot faster than the traditional method. If you have your own preferred method, by all means do it your own way! The other thing is with regards to the sewing down of the bodice lining. It is done this way to quicky encase the raw edges of the zip and bodice+skirt seamline, which sometimes irritate little girls with sensitive skin. My girls don’t really get bothered so sometimes I sew both layers down with the skirt after gathering, serge and topstitch it flat. When I made bridesmaid dresses for my baby niece though, I even took the extra step of hand-stitching the bodice lining down with a blind stitch so that the seams won’t irritate her (and cause her to want to yank the dress off halfway while walking down the aisle ;P) It certainly took a lot more time and effort but the end result was worth it. So it’s really up to you! Well, that’s the last of my Girls’ Dresses blog posts. Next month will be exciting, I’ve already got the theme planned out months ago. Can’t wait to show you guys! Lovely little “simple dress”. I think it could be sewn up so differently depending on the fabric combinations you use. Looks like it could be a great summer uniform for my daughters! thank you for the pattern. this serves as a great base for almost all party dresses, if you change just the fabric. this is an amazing tutorial. thank you very much! I appreciate you coming up and sharing this simple dress pattern. Most of the time I’m looking for something simple to sew for my girls, so this is just what I needed. I am looking forward to your drafts for other sizes because my girls are age 3 and 8,5. In the meantime I am going to try the sewing the aprons. Thanks Meli, I just updated with the other sizes. Hope they they are the right sizes for your girls! Do a test piece first before using on your actual fabric. 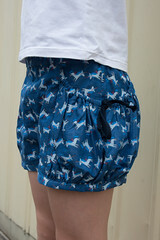 Hi, you have no idea how surprised I was when I check your blog again today, the patterns for the other sizes were up! However, I was not able to get to the links, I always get the message “page not found”. very cool project, thak you for sharing. can you tell please what bodice is it from the book ? I want to draft myself (I have that new winifred book) is it the ‘flat’ woven fabric block? Thanks a lot for your work… I really appreciate the videos !! Hi, is it possible to extrapolate this pattern to suit young adults/teens? 🙂 or is only for kids? You will need to grade the pattern to fit a larger size child/teen, because for sewing patterns in general you can’t just scale up everything on a copier. The armhole points, shoulder points, curves, etc do not increase in size proportionally. The other issue is that kids/teens patterns differ from women’s patterns because of their development 🙂 So for young adults the bodice needs to be adjusted with darts for shaping. It can be worn as a loose fitting dress style if you prefer to do without darts. So to answer your question, if you mean to grade the pattern then yes you can do so to fit a young adult/teen, but you can’t scale up proportionally because it won’t fit well. Thank you very much indeed for yr pattern, videos, tutorial… As I am not so experienced it is exactly what I need now for my 4y granddaughter, a basis for a lot of models. Thanks again for yr great effort. Hi.. Im dena from Indonesia. Tq so so so much for ur free pattern n video tutorial. Really love it n honestly so much waiting for this pattern, coz im looking for this with blog walking, so many blog im visited, n finally i found u..
Im just new bie, start to sewing just in my 33, n hopefully, it’ll helps me to b a superb mom..
Btw, do u hv a pattern simple dress for woman? 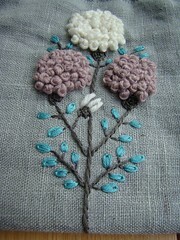 Or mightb, would u like to show me a link a free pattern of it? Hi there, sure go ahead and share my blog links on your page. like to check what is the length and width of the bottom? As I can’t find it. Hi! I am in the middle of making 4 dresses for 4 granddaughters. I just finishes Simple Dress size 86. The next dress is Simple dress size 110 does and it does not give the skirt size printed on the pattern. . Would you be able to send it to me. Thank you. A Grandmother.